soldier needs. Peace has its victories, but it takes brave men and women to win them." Thank You to those who serve in our Armed Forces today, and to the Veterans who have sacrificed of themselves for our country in the past. We salute you! Have a happy and safe Memorial Day with family and friends, but remember the meaning of the day! Today Elsie and I can be found in the garden. Bob has a shooting match, and the kids have taken a trip to Busch Gardens, so I'm spending the day watching Elsie. We'll be digging in the dirt. This is Elsie in her garden box. We'll be putting some pumpkin seeds in here today. I have to move some existing plants around, and plan to plant some more herbs. We may take a little field trip to the garden center if we need to get out for a while, but mostly we'll just be enjoying the day. My "Orange Pile" fabrics from Pat Sloan's online retreat from back in February finally went from what you see above to what you now see below! I had gotten the blocks done back on the original retreat weekend, and used Pat's recent Finish It Up Challenge to set them into a quilt top by the deadline (which was yesterday). My original intent for the borders is what you see plus a pieced inner border between the brown and orange ones, but I decided that finished would be better, so there's no pieced inner border ~ but I can live with that. I had big plans for the Finish It Up Challenge, and pulled out several older, not-quite-done projects, but with getting ready for, going to, and recovering from Quilt Market, I was lucky to get even the OP quilt top done. I plan to leave the other projects out though and try to do one a month to move some of them along. What "works in progress" do you have that you can take to the next level? I'll keep you posted on how mine are going. Had our evening Jo Morton Club last night. I missed getting pictures of the morning group, because I was away at Market last week when they had their club meeting ~ I hope you'll bring in those quilts for me to see next month ladies! This month is the last month to hand out a pattern for Jo's Little Women Club 8 and we are doing this little patriotic strippy quilt. We will have a last club 8 meeting in June to show and tell everything, and talk about what we'll be doing after that. 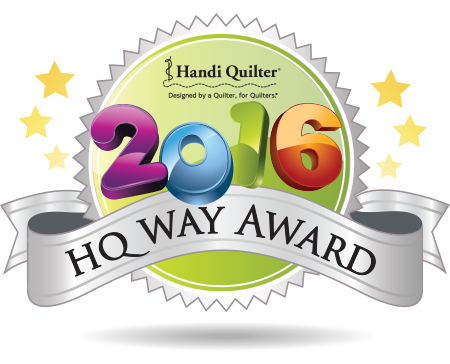 We got some of the basket quilts coming in! This is Dawn Burkett's little baskets. They were all done with the same print in different colorways. The colors are great! This is Phillis Miller's all finished and quilted! It looks so festive and I just love the border with the red. 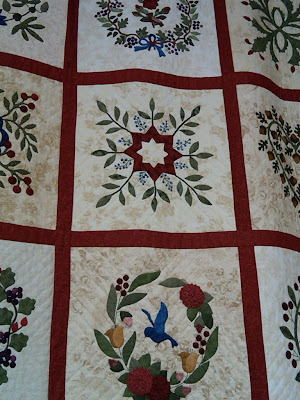 Denise Erdle set hers with the blue stars print and my all time favorite red fabric! 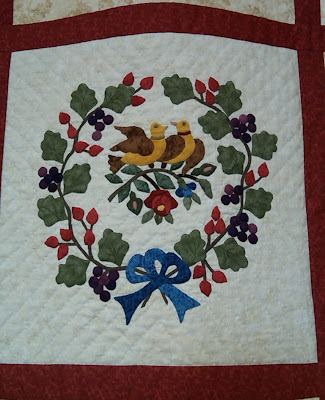 Kathy Fowler brought in a couple of past Jo Club projects all finished and hand quilted! This one was one of Kathy's versions of the nine patches we did for several month's in JLW Club 6. I love the border treatment on this one too! And we got to see a couple more Holiday Inn projects! Denise did hers with these nice crisp black frames and the gold colors in the flying geese borders look great with her outer border stripe. Luanne Lindeman used the center medallion from Peppermint Twist (from Jo's book Remembrances) and did a little something different with the hour glass border - instead of turning them she set them end to end for a different effect. I've so enjoyed seeing how everyone has done something different with the same pattern. Jo's new book, Vintage Journey is in the shop as of yesterday, so stop by and get yours! We will be doing some individual projects from this book in the fall as an interium while waiting for Club 9. I'm taking feedback of your favorite project in this book now, so let me know what you think and we'll go with the most popular. Just a quick post today to let you know that our Patriotic Punchneedle Pillow is now available as a kit with The Gentle Art thread colors included. You can purchase just the pattern, or the pattern bundled with the 7 skeins of thread needed to make the center punchneedle design! I love The Gentle Art overdyed thread colors, they are so rich! Contact me if you are having any trouble finding colors that you need from The Gentle Art. We will eventually be putting some bundles up on ebay (but can get any colors that you are looking for), and of course check out the ebay store for the kit for this cute project! Look at this scrumptious bundle of wool that I bought at Market! I got it from the Woolen Needle's booth, they hand dye all of their wool. The verigated one on top is the piece de resistance! 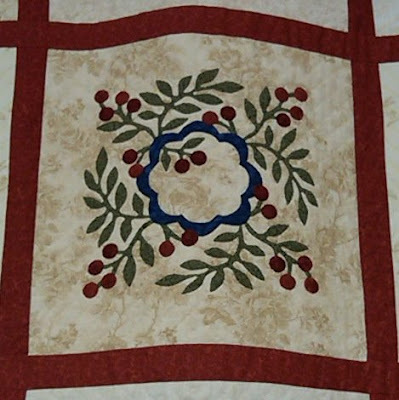 I plan on using that piece to make the leaves in this quilt called Autumn Splender by the Woolen Needle. The log cabin blocks were made with many Jo Morton fabrics, and it just so happens that I have a lot of those scraps! This is a totebag that I brought back for Heather from Jo Morton's Andover Schoolhouse session. It's made from Jo's Fairfax Co collection. 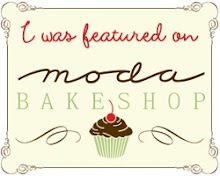 I got this little goodie from Jo's Schoolhouse session for me ~ I won one of the door prizes! It's a bundle of nine fat quarters from Jo's Crimson and Clover collection that is coming out in July. They are perfect to use in my future Circuit Rider quilt. One of the most fun things at Market are seeing some old friends, and meeting new ones. This is me meeting Lynette Anderson in her booth (waving to you Lynette!). 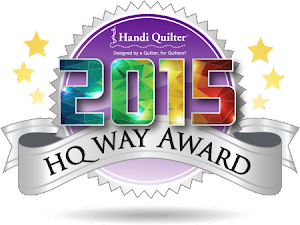 She designed the Christmas Magic collection that I just used to make my Wandering Through the Holly quilt for Quilt Magazine. Lynette came to Spring Market all the way from Australia, and is one of the nicest people to talk to that you will ever meet! I really enjoyed visiting with her in her booth and seeing all of her wonderful work! 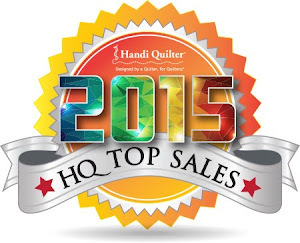 Along with all of the buying and networking, we also had some wonderful classes and Seminars. I had a class with Pepper Cory on Becoming a Better Quilt Teacher, and we attended a great talk by Karen Montgomery on Purchasing for the Quilt Shop. Karen also owns The Quilt Company a shop just outside of Pittsburgh that we made a point to go and visit on our way out of town. Very Inspirational! The whole Market experience made for a trip that I won't soon forget! Here are some of the pictures that I snapped at Market of collections that we will be getting in the shop. This one is the autumn Whimsicals collection called Pumpkins & Spice from Red Rooster Fabrics. We're also getting this Jennifer Chiaverini collection called Joanna's Collection that will be out later in the year. These bags are made from a collection by Gudrun Erla called Glow. Both bag patterns are in her new book called Fast and Furious Quilt as You Go. It's so fresh and bright. Here's a peak at Minick and Simpson's booth with a couple of quilts from their Wiscasset line that I just fell in love with. (But then I love about all of their stuff). So naturally, my big purchase from Sample Spree on Thursday night was a bundle of Wiscasset from the Moda Table. I'm planning on making some tote bags with it! Quilt Market is just booth after booth of wonderful eye candy. I wish I could share all of them with you, but there just isn't enough space. I'll try to post a few more pictures tomorrow to wrap up my visit. Pittsburgh was a great city to visit! We stayed at the Renaissance Hotel about 5 blocks from the Convention Center and could walk to an from most days. This is a picture approaching the Convention Center and as I was crossing the street I saw a train going across that bridge and just had to snap a picture. This was a picture on that same morning and I thought the sun shining off the building through the fog was really neat. (It was a little more breathtaking in person). Here's the same scene as we were walking back to the hotel that afternoon. It was nice to walk to see the city. Some days we walked along the river (our hotel was at 6th street on the river and right across the bridge from PNC Stadium). Other days we walked up Penn St which went right through the theater district. Our first day of Market was Thursday and the Exhibit Hall was not open yet. We spent the day at Schoolhouse going to presentations all day that ranged from 15 mins. to 30 mins. This Convention Center had sky walkways that we passed through to go to Schoolhouse that viewed the Exhibit Hall floor. It really gets you excited to hit that floor first thing Friday morning! I have some pictures of inside Market that I'll share tomorrow. Today is all about unpacking, laundry, getting some groceries in this house, then lots of computer work this afternoon. Lots to do, but it's good to be back home. It turns out that this is my 99th post, and I’m just getting ready to head out of town! 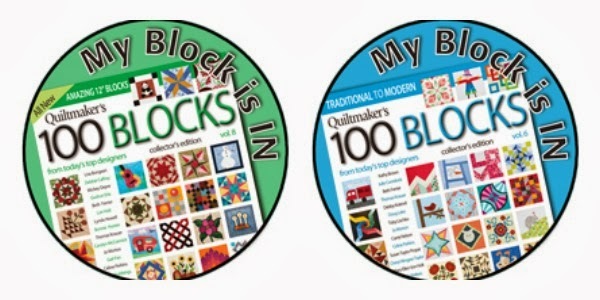 I’m leaving this morning for Quilt Market in Pittsburgh PA, so I won’t be posting for a couple of days ~ we'll be staying pretty busy from early morning until late in the evening each day. In honor of my 100th post, (which will occur when I get back) I wanted to do something special, and having a blog give-away seems to be the tradition. So…since I’m sure I will get lots of goodies at Market, and just for fun I will gift a sampling of items (It will be a surprise) to one random person who leaves a comment on this post between now and midnight on Sunday, May 17th. I’ll announce the winner on Monday the 18th. Make sure that I am able to email you from your comment. 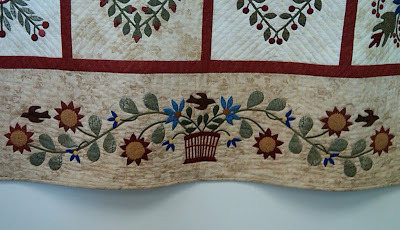 Yesterday was my monthly Baltimore Album Class and we were all inspired by a beautiful quilt made by Helen Quane. Helen was a long time employee at Seminole Sampler Quilt Shop who recently passed away. 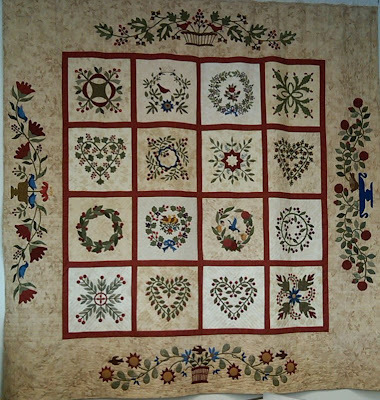 As a memorial, Seminole Sampler is showing many of Helen's quilts throughout their shop during the month of May, and you can also view them on thier website. I loved the colors in this quilt and how she used different backgrounds in the blocks. The star block above is one that I have planned to make in mine. Most of these blocks are in Elly Sienkiewicz's books and are 12" (design size) with the block finishing at 15". The one above however, can be found in the City Spring Commemorative book put out a few years back. I've also been thinking of including that one in mine. I have seen these little love birds in one of Elly's books (I don't remember which, I'll have to go on a hunt), but I never thought to make them in gold and I just love them! I still really don't know what I'm going to do with my borders, but I was thinking of having some birds here and there. Helen made each of her borders different and I think it really works. Again she used the gold color in a cool way as the rouched rose centers on these flowers. It's amazing how a quilt can reach out, even past the life of the person who made it, to touch and inspire so many others. What a wonderful gift! Happy Mother's Day! Do something enjoyable today. Here is a quick look at a quilt top I finished yesterday called Louisa. This is made with the fabric line by the same name designed by Terry Clothier Thompson for Moda Fabrics. 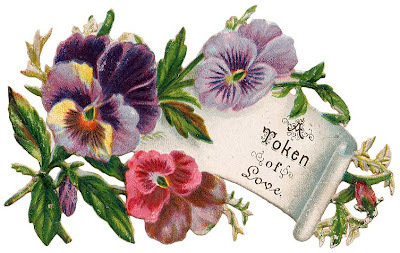 It has great old fashioned appeal and the colors are really sweet. 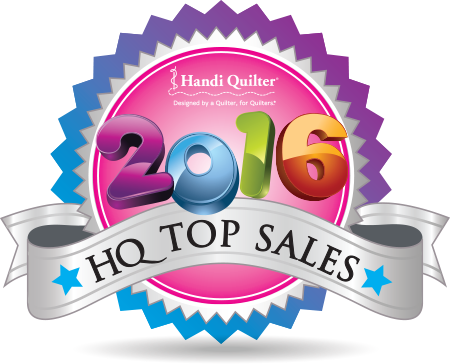 The top measures 65" x 82" and we do have some kits left of it over at the And Sew It Goes website. Late last night I finished my next Baltimore Album block for my class on Monday. At least I finished the block as it was designed. The folded rose buds are the skill that we learned this month, and I chose this block because I wanted to do an inking in the center of our house. But I now have a slight change of plans. Can a quilt from my childhood be called vintage? I suppose a quilt made in the early 1970s qualifies as vintage now. My mother made this quilt using all scrap fabric from clothes and other fabrics found in our household from the 1960s and early 70s. I love this quilt, but didn't know where in my house these colors would fit. But when I first put it on the bed in our spare bedroom which is my blue/white room, it just lit the room up! I think it screams Spring. There are so many fabrics in this quilt that have memories for me. The center of this red flower is made from the first thing that I sewed ~ a blouse that I won a red ribbon on in the Howard County Fair! To the upper left in this picture there is a brown/orange floral that my mother had recovered some chairs in our house with. The plaid in the upper right corner was an outfit that my mom wore. This daisy print was from a summer dress that my mother wore. (She made a lot of our clothes). This cool mushroom print was from a matching short set that my mother made for me and my little brothers ~ how early 1970's is that? It's hard to see it well, but here is a polaroid of us wearing the outfits. My mom had a matching sun dress as well, but she is probably taking the picture. 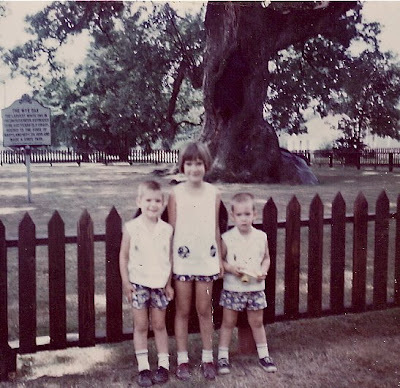 We're standing in front of the Old Wye Oak that was located in Wye Mills on the Eastern Shore of MD in August 1970.